Spartanburg County is a collaborative community in the northwestern part of South Carolina with a population of almost 300,000. Download our report and outside reports of interest. Follow links to more resources and information. Our children will excel academically and our citizens will demonstrate high levels of baccalaureate degree attainment, rendering Spartanburg the best educated county in the state. Since 2009, there has been a 21% increase in residents ages 25+ holding a Bachelor's degree or higher bringing the total to 23.3% of citizens. In Spartanburg County, 59% of students qualify for free or reduced meal plans in 2014. All 7 school districts earned an "excellent" report card rating in 2014. The Spartanburg Community Indicators Project partners with Indicator Area Leaders to improve outcomes in each of its seven Indicator Areas. These organizations set improvement goals based on indicator data and lead individuals, businesses and community groups to coordinate efforts and information, thus facilitating steady progress in quality of life improvement. 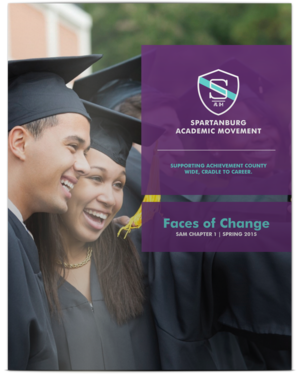 The Spartanburg Academic Movement (SAM) serves as the Indicator Area Leader for the Education Indicator Area. SAM convenes a group of professional and nonprofit groups working together to improve education outcomes in Spartanburg County. SAM coordinates their efforts through an advisory council. They have developed goals in education priority areas. Each priority area's work is guided by a Collaborative Action Network (CAN). Key variables that are most reflective of the state of education and are useful predictors of education trends. Every child will enter kindergarten prepared to succeed. Every child will be reading to learn by third grade. Every child will succeed in Eighth grade math. Every student graduates from high school college and career ready. Every high school graduate enrolls in post-secondary education and every post-secondary student persists to completion. Variables that have direct impact on or are tangentially reflective of the state of Education. High school dropouts are at significantly higher risk than high school graduates for a number of negative life outcomes. They are likely to earn less, rely on government assistance more, have worse health outcomes, and are more likely to be imprisoned. College enrollment is the first step to college completion and assessing the enrollment pattern differences among high schools can be instructive for improving enrollment rates. The freshmen retention rate is a measure of whether freshmen thrive on a particular college campus and proceed to their sophomore year. The strongest predictor for college completion is first-year student retention. In addition to the economic and social benefits of higher education to the individual, a well-educated populace results in increased tax revenues that flow back to the community. For communities to improve competitiveness in the knowledge-based economy, well-educated workers must be available to current and potential employers. Retention of college graduates is essential for a community's economic development. Assessing the cost of tuition and the availability of funding and scholarships is essential to increasing accessibility to higher education for our citizens. Indicators in more than one Indicator Area that have tangential or predictive impact on Education. There is a strong correlation between education and poverty. Children growing up in poverty complete less schooling, work less and earn less as adults, are more likely to achieve public assistance, and are more likely to have poorer health. Boys growing up in poverty are more likely to be arrested as adults and girls growing up in poverty are more likely to give birth as teenagers. Income is highly positively correlated with educational attainment. On average, people with more education have higher incomes regardless of geography. Unemployment is highly negatively correlated with educational attainment. On average, people with more education are less likely to be unemployed regardless of geography. Births to mothers with less than a high school education is a closely tracked statistic that crosscuts both public health and education because it is one of the strongest predictors of a child's failure to graduate from high school. All Rights Reserved Strategic Spartanburg.